OK, so you’ve had your list for a few years, and you’ve happily gathered hundreds, thousands, even tens of thousands of happy readers. Congratulations! And then comes Spring Cleaning — which virtually no one does, or even understands why it’s a very good idea. Here’s what I mean. First, consider the list has been active “for a few years.” Even though most readers are happy with what you’re sending them, some of your readers are no longer engaged. They’re not opening the messages, they’re not reading them, and they’re certainly not clicking links or taking you up on your “call to action” in the messages. They’re dead weight. So what: isn’t it nice to have lots of people on your list? Well, no — no it’s not. 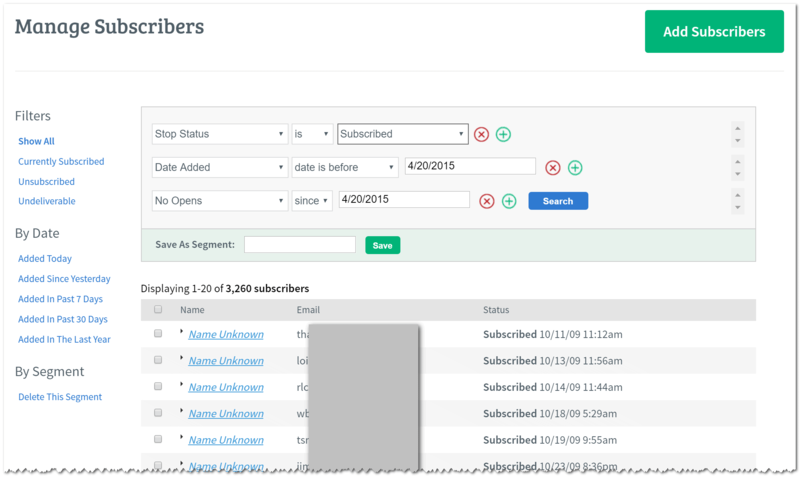 In fact, those “subscribers” are harming your email efforts. Not just neutral, actual harm. How so? Large mailbox providers (such as Yahoo or Gmail) monitor how engaged the readers are. They see that newsletter@example.com sends messages regularly to a lot of their customers, and they see whether their customers open those emails, and even how long they spend reading them. Why? They want to be able to assign a reputation score to newsletter@example.com. So it’s terrible for your reputation if users trash your email without opening it, and the bigger the percentage who do that, the worse the hit on your reputation is. And trashing them without opening them isn’t even as bad as setting a filter to trash them or, even worse than that, that their customers click the “This is Spam” button (or create a filter to automatically mark it as spam!) Yikes! It’s not only those who don’t care about your messages anymore: people abandon email addresses because they get too much spam, or they forget “that one” that they use for newsletters, and some folks die, yaknow? One way or another, those messages aren’t being read, and that counts against you in the score. So what do those email providers do with that reputation score? It’s part of their equation as to whether your future emails show up in your subscribers’ inbox …or not. The worse your reputation, the more likely it is that your email will end up in your subscribers’ spam bucket. And that’s obviously bad. Lots of users never check their spam folders unless they’re missing something. And for most, “Out of sight is out of mind” — they just won’t think about your newsletter for weeks, months, or maybe ever. And your reputation suffers! Spring Cleaning! 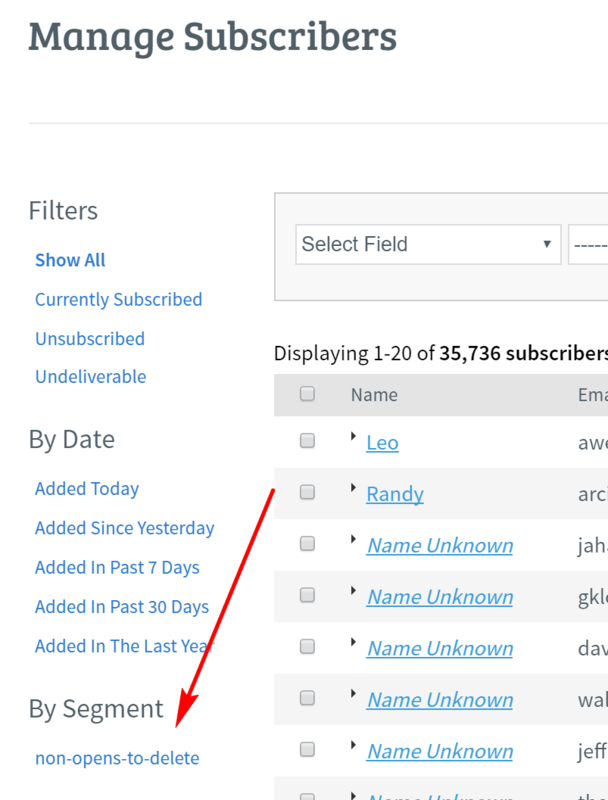 Most ESPs (see my article on Email Service Providers) track the opens on emails. Sometimes you have to set it to do that tracking, sometimes it’s the default. 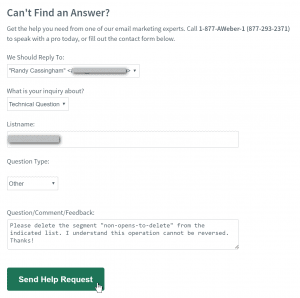 The following assumes you’ve been tracking the “open and click rate” on your newsletters. If not, get going on making sure you have that turned on in your ESP, and return to this step later! So assuming you have been tracking your open and clicks on your newsletters, it’s time to find out who has not been opening your newsletter, or clicking your links. Here’s how it’s done with the ESP I use, AWeber. How Does the ESP Know There Haven’t Been Opens? In AWeber, there’s a tracking pixel in each message that, if the subscriber opens an email and has images enabled, and thus that pixel is loaded, AWeber records that message as being opened. The pixel has a specific name that identifies the subscriber and message number, so each individual message sent out has a unique pixel filename (address, or URL). Cool! But what if they don’t have images enabled? They opened the message and read it, but are never counted! Well, if you have link tracking turned on, and your reader clicks any link in that message, you get an “inferred open” — they couldn’t very well have clicked a link if they didn’t open the message, right? So they’re counted. If they have never opened a message, or ever clicked a link, they can hardly be considered an “engaged reader”! And that’s hurting your reputation score, so we’re going to drop those readers. As you can see above, there are 3,260 of them with those search parameters — almost 10 percent of the list! That’s too many to delete by clicking boxes and “delete,” so I’m going to have AWeber Support do the work for me. But I need a way to make it very, very clear to them exactly which subscribers I want them to delete for me. Now I can put in a ticket with AWeber Support with the request that they delete that specific segment from my list. They’ll send back a reply with an “Are you sure?” and “Please confirm you really own this list” (even though you put in the support ticket while logged in! ), and then they’ll delete it for you. So What Good Is That? I’ve Lost a Tenth of My List! That’s Terrible! It sounds terrible to lose a tenth of your list. You’ve spent a lot of effort getting people to subscribe! You want a big list! Isn’t it awful to lose so many?! No: it’s terrible for the dead weight to be on your list, because they’re not engaged. They’re not opening your messages, they’re not reading them, and they’re not clicking any links — none in at least a year! Again, they’re damaging your reputation, making it harder for those who are engaged to receive your messages. Plus, at most ESPs (including AWeber), your monthly bill is determined by how many addresses are on your list, so that dead weight is costing you money as well as not earning you a cent. Again, they are, in very real ways, hurting you. You’re not “losing” 10 percent of your list (or whatever percentage your search came up with), they’re already “not there.” You’re paying for phantoms — with your cash and with your reputation. Cut off the dead weight that’s dragging you down! Yet most list owners have never done this. They have given no thought at all to their reputation scores, most likely because no one ever explained this to them. 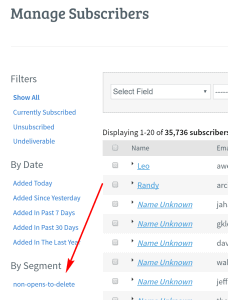 And yes, I really did tell AWeber to delete that segment from that list today, deleting almost 10 percent of the subscribers to that particular list. I do this every Spring: the cultural meme of “Spring Cleaning” reminds me to do it yearly on every list that’s more than a year old. Fewer addresses means a lower ESP bill. Increases the percentage of your messages that end up in inboxes, rather than spam folders. And: you have fewer irritated once-subscribers who no longer care about your messages. 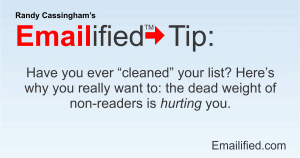 Have you ever cleaned your list? When is the last time you did so? Do you know if Aweber or other ESPs have the ability to mail an “are you still interested” email to a list segment? I know I’ve received such emails from some lists I’m on. Basically, it’s a simple “click here to remain subscribed, otherwise you’ll automatically be unsubscribed” message, similar to the initial confirmation email when you first sign up. Sure. It’s called a “re-engagement campaign”. Once you save the segment, you can send a message specifically to that segment. Something like, “My system says you haven’t clicked any links in a year, and I don’t want to keep mailing you if you’re not interested. If you want to remain on this list, you must click THIS LINK by the 31st of the month or we’ll unsubscribe you.” The link can be to anywhere (e.g., your home page), as long as it’s an ESP tracking link, but better to send them to get something, like a bonus report, or something fun. If you think it’s best, you can do a series of messages, redoing the segment each time so that it’s up to date (doesn’t include any who clicked the re-engagement link). After the cutoff date, you redo the segment again so that only those who didn’t click the link are gathered up, and then you delete that group (or have support do it, if it’s large). All that said, I usually don’t bother: if they aren’t interested enough to click a single link in an entire year, they’re not engaged enough that I want to continue to pay to keep them on my list. Hi. I remember you doing this with your True newsletter. That seemed to be for everybody, unless my recollection is failing me (as seems to be happening more often recently). Do you recommend doing this every “few years”, or is it better to do this more often? The article sounds like the reputation score is too important to go “a few years” without cleaning it. Thank you. Both newsletters are great. Thanks for your kind words. I note in the article, “I do this every Spring: the cultural meme of ‘Spring Cleaning’ reminds me to do it yearly on every list that’s more than a year old.” There’s a lot in the article, so thanks for helping drive the point home. Indeed, “every few years” is way too long between cleanings, since indeed the reputation score is too important to let it wallow for so long. 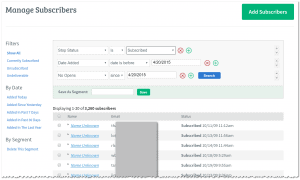 You mention that ESPs use pixel markers and can detect when a link has been clicked to determine whether a subscriber is engaged. I use Windows Live Mail and, before that, Outlook Express for my email. In both of those, it’s possible to read an incoming email without double clicking to open it or clicking a link. For that particular email/issue, there may be nothing I’m interested in but I still want to stay on-board. For example, as a small business owner, I get newsletters from suppliers on the edge of what we normally deal with. I may not buy from them this year, next or even ever, but they just might come up with something interesting, so I want to keep getting their info. Can they still tell somehow if I’m engaged, if I get the email in my Inbox but don’t double click/open or follow a link? Just curious, partly for incoming emails and partly for setting up our own outgoing newsletter. Absolutely no one should do “spring cleaning” after one issue that maybe some percentage didn’t have interest in. But read what I actually said: gather up those who “have been subscribers for some period of time (say, a minimum of one year),” and “in that same period of time, have ‘No Opens’.” While you can’t expect interaction from every reader to every newsletter, those who do no interaction for a year are causing damage, so yes: drop them off. They were loving it and miss it? They can subscribe again. Though even still, if they’re not even interested enough to click on anything in an entire year, why should we be interested in spending the money to send them newsletters?